In our previous articles, we have given CA Final Question Papers and CA Final Suggested Answers to last 10 attempts. Today we are providing CA Final Group - 1 and Group - 2 mock test papers (MTP) for Nov 2017. After you complete the revision of the whole syllabus at least once, you should solve the questions given in the RTP. After second revision of the complete syllabus, you may assess your preparation by taking mock tests conducted by various branches at their end. Also, Mock test papers are hosted on the institute’s website www.icai.org that you may download and solve within a period of three hours. Mock exams let students practice revision strategies that are proven to be more helpful and discover what works best for them. There are several memory strategies that have been found to be effective. In one of the most comprehensive reviews on memory, researchers found that the following strategies are useful: spacing out revision sessions (so that there is enough time to forget and then re-learn); teaching the material to someone else (this forces you to think about the material in a clear and structured way); and switching between topics every now and then (which helps you build on previous revision sessions). Testing yourself is an effective way to improve your knowledge and ability to recall information. In a study on mock exams (pdf), researchers found that students who did a practice test after a period of revision did better on the final exam than those students who did not do the mock exam and had just spent the whole time revising. For every attempt, ICAI provides two sets of mock test papers with suggested answers for CA Final students, here we are providing direct download links to CA Final MTP. Click on the links. 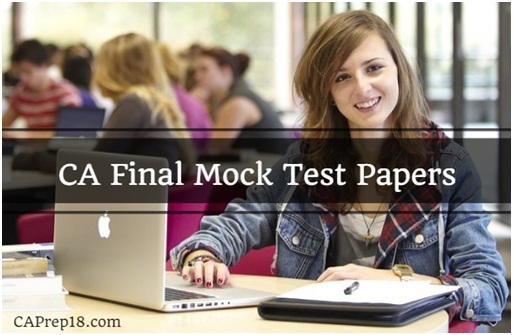 I hope this article this article will help you to download CA Final mock test papers for Nov 2017. If you are facing any issue while downloading these mock test papers, you can feel free to reach us at contactus@caprep18.com or on our toll-free number 1800-212-8575. Share this article “Download CA Final Mock Test Papers for Nov 2017 by ICAI” with your friends who are going to write CA Final exams in Nov 2017.